Every weekend when I put together my menu for the upcoming week, Southern cuisine is always in the back of my mind. That might have to do with the fact that the Southern husband is lobbing suggestions at me a mile a minute, and lots of them have the words “grits” and “okra” and “I remember that Granny used to make…” in them. So recently I decided to go for something he loves that I have never made before. 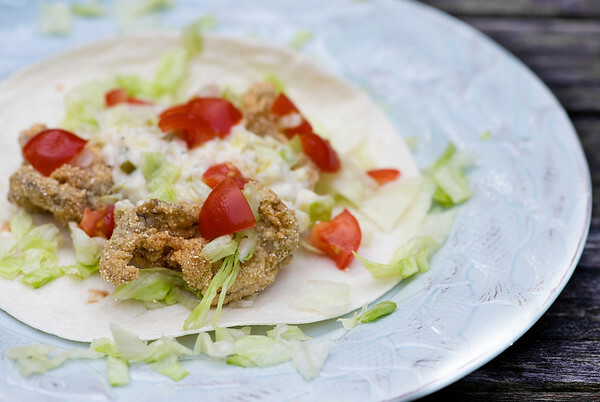 Fried oysters with homemade remoulade sauce, all tucked up into warm flour tortillas. Now, one of the things you need for this recipe is, well, oysters. 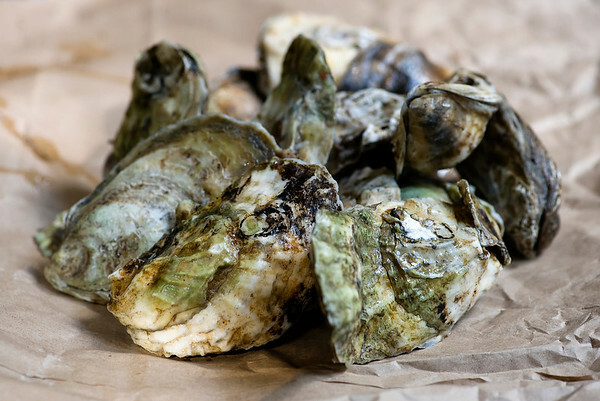 And I was mulling out loud where I might be able to find shucked oysters, which apparently is not a good thing to say to a Southern man, because he looked at me like I had lost my mind for a minute. “I can shuck oysters just fine,” said he. Which is how we ended up with a pile of these later that day. Aren’t they pretty in their oyster-ish way? Like a little bit of the ocean right there on my kitchen counter. When the time rolled around to make the oyster tacos, I gave the Southern husband the heads-up that oyster-shucking time was nigh. And then I got the first inkling that this might not be as easy as it had been advertised when he showed up in the kitchen with his pocket knife and picked up an oyster and turned it over a few times. Hmm. I may be just a Northern girl, but I thought I had remembered somewhere that shucking oysters can be a little bit of a messy business. And sure enough, little bits of oyster shell starting winging their way through the kitchen. And the oysters weren’t being, well, cooperative. This was apparently the oyster-shucking equivalent of suggesting that we stop and ask directions in those pre-GPS days of being hopelessly lost somewhere. Not a chance of happening. Anyway, now that the shucking was done, we got down to the business of frying those babies up. They get dunked in a mixture of cornmeal and flour and a couple of other things, and fried oh-so-quickly in a bath of piping hot canola oil. Once they are nice and golden, they get popped onto warm flour tortilllas with a little chopped lettuce and tomato and a generous spoonful of an easy homemade remoulade sauce. And I can tell you this for sure: one bite of a warm oyster taco with creamy spicy remoulade sauce and all your oyster-shucking and assorted other worries will disappear. Put the relish in a fine mesh strainer and drain for 10 minutes. Put the strained relish and all remaining remoulade ingredients in a bowl and mix well. Chill. Whisk the first five ingredients together in a bowl. Dredge the oysters in the cornmeal mixture and carefully add to the oil. Fry until golden brown, about 2 minutes. Remove with slotted spoon and drain on paper towels. Heat tortillas on a griddle or in the microwave until warm and soft. Place 3 oysters, a handful of lettuce and some tomatoes on each tortilla. Top with a generous spoonful of remoulade sauce and serve. Oh MY! YUM! I can’t wait to try these!!! They look so YUMMY! They are!! And fun to have in the summer – they remind me of the beach! I love oysters, the simple mention of them bring back memories of vacations by the beach with my parents. Their friends always made the best sea food dishes. You always have such fun stories. Thank you. Well I may postpone this recipe until I get the.boy brainwashed enough that he learns how to shuck oysters…but it does look delicious! Everywhere I’ve lived, they’ve had oysters in jars in the packaged seafood section of Safeway. I use them in my Thanksgiving turkey dressing, so I have looked for them. My dad would have loved these tacos. Oysters were one of his favorite things. Great idea.